Fire Sprinklers protect people, buildings and structures. 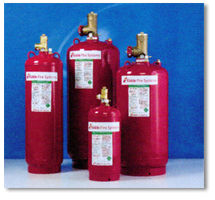 Advanced Fire suppression systems protect people, downtime, business interruption and critical assets. With products like FM200, FE13 and Ecaro25, people friendly, non-damaging chemicals are used to suppress fire by removing heat in seconds rather than using water that take minutes to act as well as causing irreparable damage to critical assets. Specialized products like PROINERT and NOVEC 1230 are non-ozone depleting, global warming standard compliant aimed at "green compliant" suppression applications. 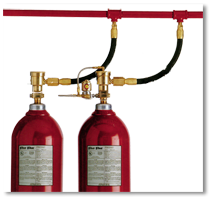 CO2 Fire Suppression is utilized to quickly suppress fires in non-occupied spaces by total comprehensive flooding and/or focused local applications. Carbon Dioxide reduces the oxygen level to the point where combustion cannot occur. Foam smothers a fire to eliminate oxygen thereby preventing harmful vapors and odors escaping into the air. Water mist extinguishes fires using a fine water mist generated with intermediate pressure through limited, economic piping using far less water than a traditional sprinkler system making it safer to use with valuable assets. For more information about fire suppression system design and installation, please contact us today.